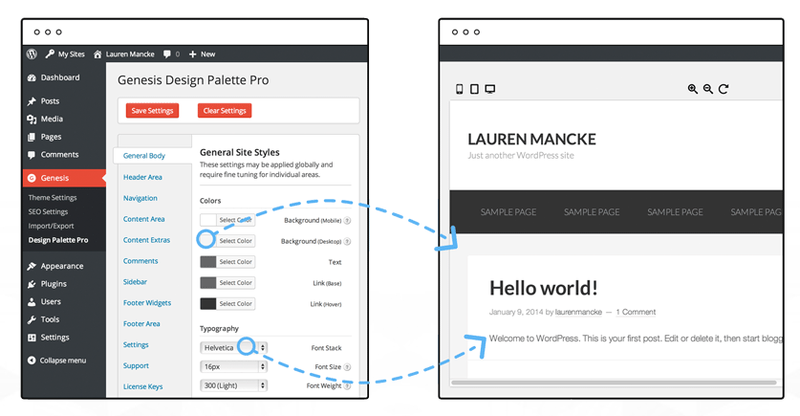 I’ve been a happy customer of StudioPress for many years — and, at the heart of all StudioPress WordPress designs is their hugely popular Genesis Framework. Genesis is an efficient framework that takes a minimal approach to features and options. 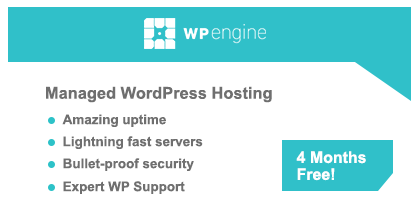 Because of this, it’s missing a lot of functionality that other WordPress frameworks offer, but this was, of course, by design. 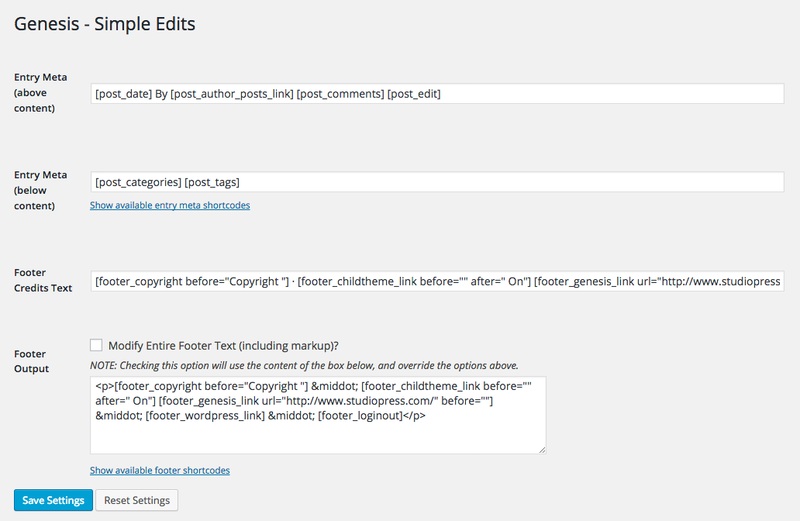 Genesis does not suffer from a bloated settings area like other WordPress frameworks do, but there are times when I wish I could make certain changes in the options area instead of having to use custom functions. Thankfully, there are a lot of official and third-party plugins available for Genesis that extend the functionality of the framework. In this article, I’d like to share with you what I consider to be the best Genesis plugins available. Genesis Simple Edits is the first plugin I install whenever I’m using a Genesis child theme. It allows me to quickly modify the meta information displayed in my blog posts and customize the output of my footer. If you only need to customize your footer text, you may want to consider Genesis Custom Footer instead. Unfortunately, the Genesis framework does not include an option for changing the website favicon. If you’d like to add this functionality for clients, I recommend installing Genesis Favicon Uploader. Genesis Simple Customizations boasts many more customisation options than Genesis Simple Edits. It allows you to easily remove the Genesis favicon image, post information, post meta, footer text, and the edit link. The sub navigation menu can also be removed or placed underneath the header. The plugin also lets you change the position of featured images and category descriptions, and you can customize the text of several fields. Genesis is famed for the number of hooks it offers. These hooks allow developers and Genesis users to easily insert content into specific areas of their website. If you’re not sure where these hooks are positioned, I recommend installing Genesis Visual Hook Guide. The plugin will display an overlay on your live website design, highlighting the areas the hooks refer to. It’s the most practical solution available for seeing the location of Genesis hooks. 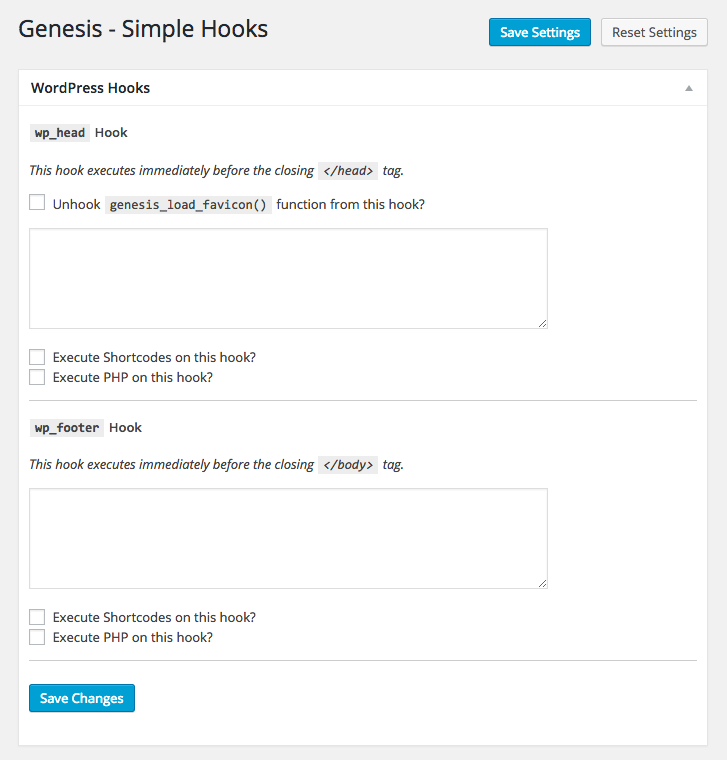 Genesis Simple Hooks allows you to easily add code into any area of your website. All you have to do is enter your HTML, shortcode, or PHP code into one of the many Genesis hooks available. It’s very simple to use — and also very effective. Genesis Design Palette Pro is such a useful plugin that StudioPress chose to promote it on their official website. It allows you to edit every aspect of your website design without having to worry about any code. The only thing that I don’t like about Genesis Design Palette Pro is that it doesn’t come included with the Genesis framework itself! 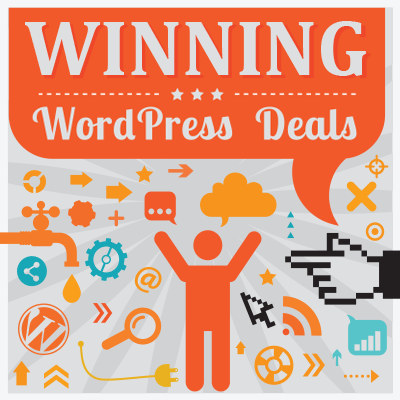 The plugin retails at $49 for a single license, $89 for five websites, and $199 for 50 website licenses. All plans come with one year of support and updates, import and export functionality, and access to documentation. 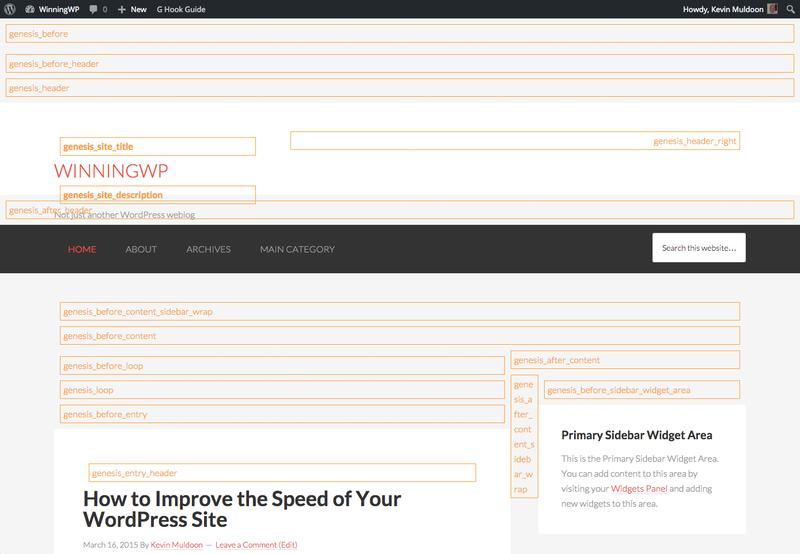 If you prefer to modify your website using the WordPress customizer, you may want to try Genesis Super Customizer. Boasting more than 100 customization options, it’s by far one of the most flexible solutions available for Genesis. Once Genesis Super Customizer has been activated, you’ll be able to modify every element of your website design. This includes your header, sidebar, form settings, button layout, navigation styling, and much more. 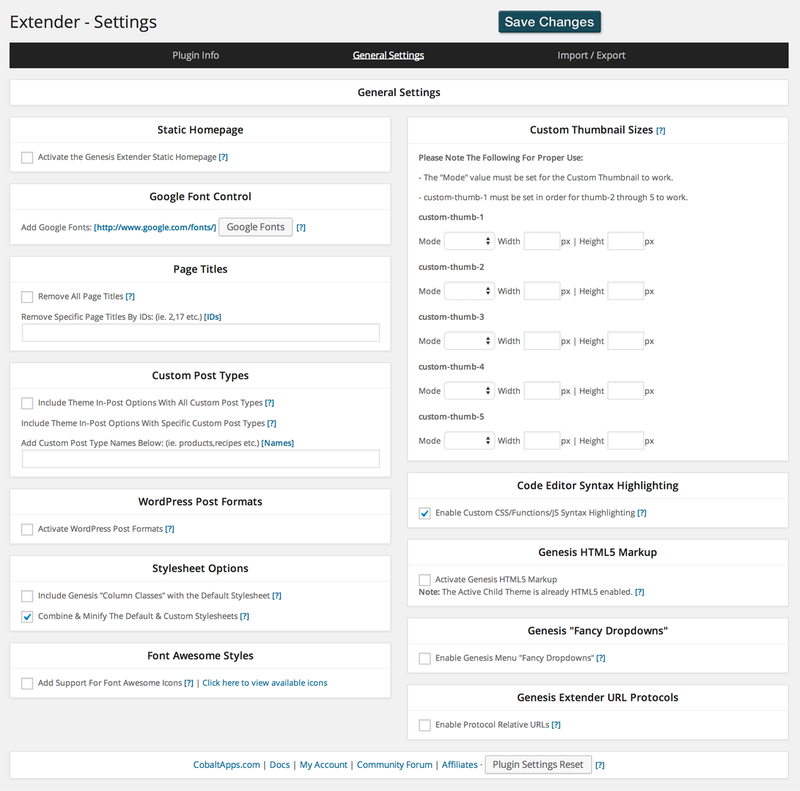 Genesis Extender is a versatile plugin that was created for Genesis developers. Genesis Extender retails at $49 for one website, $89 for three websites, and $149 for unlimited use. All licenses come with one year of support and updates, with yearly renewals at 50% of the original cost. 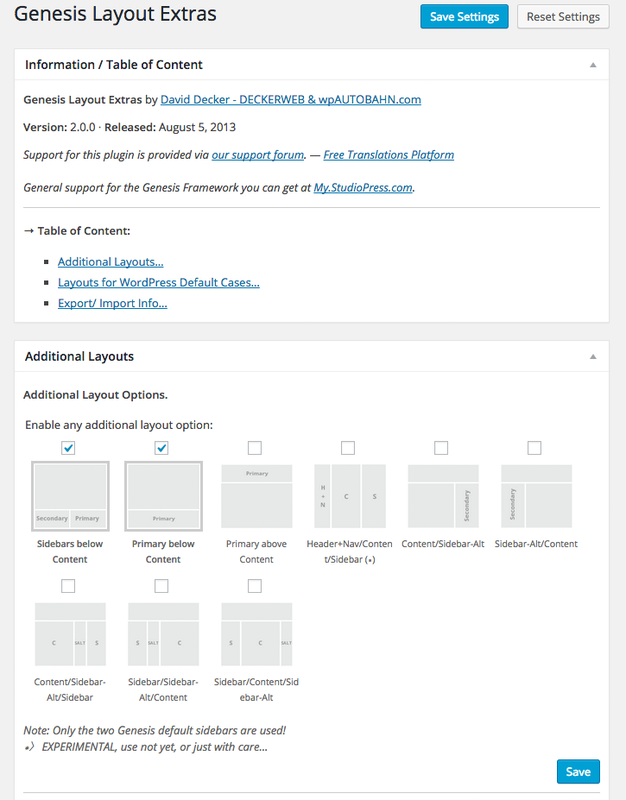 Genesis Layout Extras can be used to modify the default layouts of your homepage, posts and pages, categories, archives, author pages, 404 error page, attachment, search results page, and more. It supports custom post types added by Genesis child themes, and plugins such as WooCommerce, bbPress, and Easy Digital Downloads. It’s difficult to classify Genesis Club Pro, because it does so many things. It adds 25 features to your website, which include video landing pages, a notification bar for your header, a favicon uploader, author signatures, an image slider, and more. Genesis Club Pro retails at $57 for a single license, $97 for a multi-license, and $197 for a developer license. All plans come with one year of support and upgrades. As I’m sure you’re aware, there’s an abundance of social media sharing plugins available for WordPress, and all of these can be used with the Genesis plugin. However, you may want to consider a social media sharing solution that was designed specifically for Genesis users. Genesis Simple Share is one such option. It’s a simple plugin, but I love its clean professional look. Designed by StudioPress, Genesis Simple Share can add a small or medium social bar, or large social boxes to your website. It can be applied above and/or below your content area in blog posts, pages, attachment pages, and archives. Two other plugins you may also want to consider are StudioPress’s Simple Social Icons and asynchronous loading solution Genesis Optimized Social Share. The popularity of Genesis means that there’s an abundance of plugins designed specifically for the framework. In this section, I’d like to list the rest of the best. These plugins will help you extend navigation and make it easier for visitors and search engines to find your content. 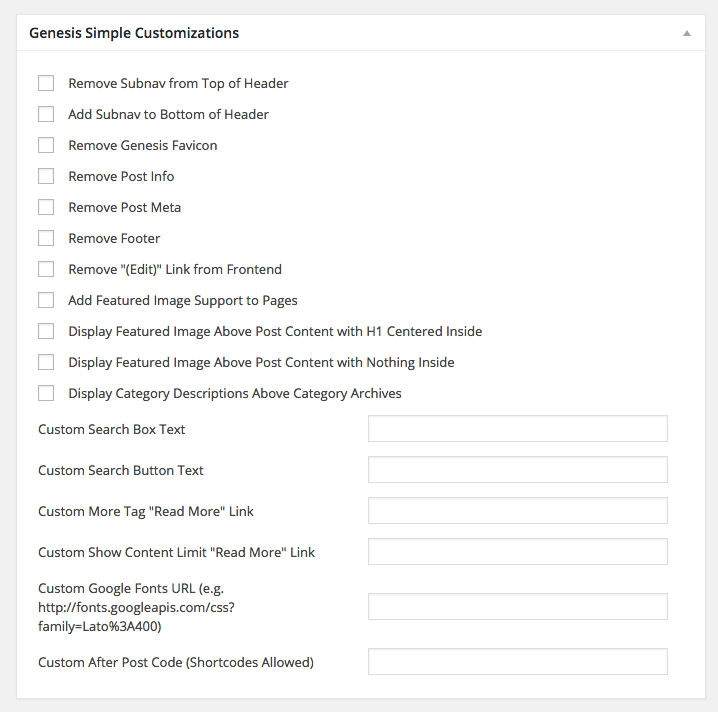 Genesis Simple Menus — A useful plugin that lets you assign a WordPress menu to the secondary Genesis navigation menu on a per post, per page, per tag, or per category basis. Genesis Title Toggle — Allows you to disable titles on specific pages. Genesis Grid — Can be used to display archives in a grid. Genesis Single Breadcrumbs — Allows you to disable breadcrumbs on specific posts and pages. SEO Data Transporter — Extremely useful if you want to transfer SEO settings from Genesis to an SEO plugin such as All in One SEO or WordPress SEO. Genesis Simple Sidebars — An easy way to add new sidebars to your Genesis-powered website. Useful styling-related plugins that’ll help you change the way your website looks. Genesis Style Trump — Forces the Genesis child theme stylesheet to load later. Genesis Printstyle Plus — Adds a printer-ready stylesheet file to your website. Genesis Simple Page Sections — A simple way of making parts of your page span the full width of the page. Genesis Responsive Slider — A stylish responsive slider that was designed specifically for Genesis. Simple Custom CSS — Allows you to easily add custom CSS to your website. This plugin is not designed specifically for the Genesis Framework, but it complements Genesis well. A collection of widgets designed for websites that use the Genesis Framework. Genesis Sandbox Featured Content Widget — Adds Genesis featured content support for custom post types and taxonomies. Genesis Tabs — Displays a tabbed widget box that shows blog posts and their featured images. 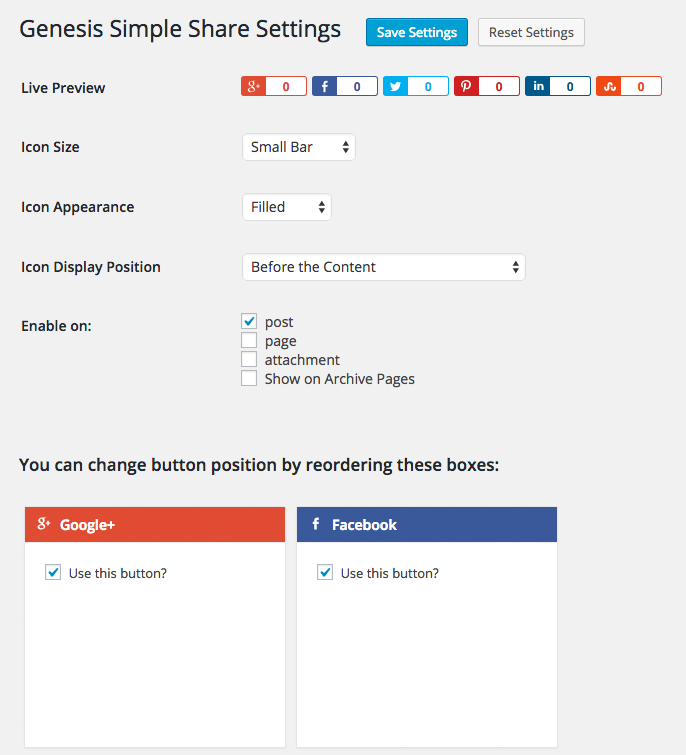 WP Genesis Box — Helps you promote Genesis on your sidebar. Genesis Author Pro — Lets you add a book library to your Genesis website. A number of plugins are available that help you improve specific StudioPress child themes, such as Genesis Prose Extras and AgentPress Listings. 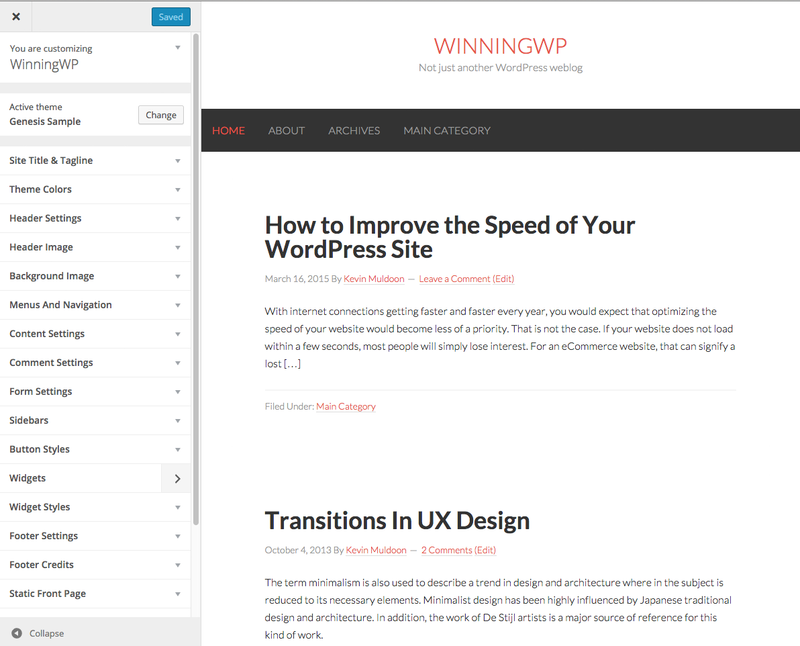 There are also a number of plugins available that help integrate Genesis with popular WordPress plugins. These include Genesis Connect for BuddyPress, bbPress Genesis Extend, Genesis Connect for Easy Digital Downloads, and Genesis Connect for WooCommerce. If you want to install the latest version of Genesis, check out Genesis Beta Tester, and be sure to install Genesis Translations if you want to translate your Genesis website. I hope you’ve enjoyed this look at what I believe to be the very best Genesis plugins released to date — a selection that will, hopefully, help open your eyes to just what can be achieved using this incredible framework! Using any of the above? What’s your favorite Genesis plugin? Did you check out WP CLIPS? It adds a separate folder (a Clip) of blank custom CSS, JS & PHP files which can be used to customize any Genesis child theme and keep custom code safe from theme and plugin updates. There is also a multisite version which adds a custom Clip to the network and each individual site, allowing you to customize cross network or each site using a single Genesis child theme installation. Would love to be included in your post if you see the merit. I want know if this plugin: “Genesis Printstyle Plus” work with the last versione of genesis? Did you know that Genesis Responsive Slider you mention above has not been updated for over two years, and appears abandoned ?